Virtual reality games, gladiator fights and live stream escapes, it’s all part of Lost in the Game, a fictional storyworld that manifests itself in many different ways. It has become an annual tradition, after the Zappendael Case, the Hidden Island and the Secret of Eyck, Zapp brought a new and exciting mission this year. For several weeks the Zappers are engaged in this omnipresent storyworld. Every school day a new episode of Lost in the Game is aired on tv. A group of children are invited to a survival camp, but strange things seem to happen there. When some children suddenly disappear, the others secretly investigate what’s going on. Gradually it becomes clear that a questionable virtual reality game plays an important role, but finding out the truth is more dangerous than they expected. On Saturdays an episode of the Zapp mission is aired. 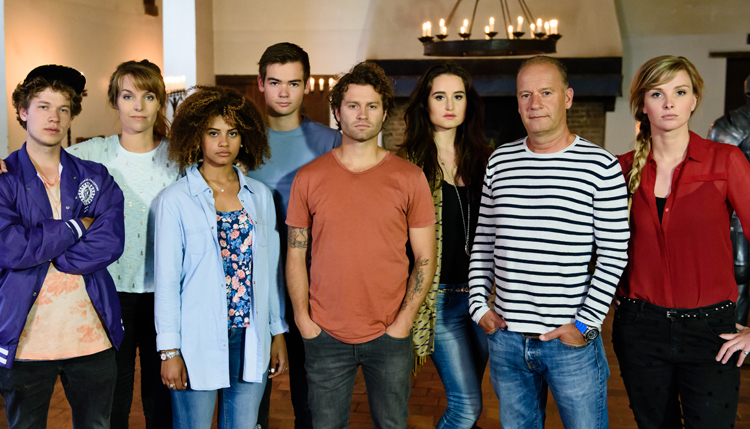 Eight presenters are locked up in a castle during an excursion. To get away each one of them has to play a very special game to save his ancestors in history. To be admitted to the game they must first prove themselves by finding their way out of an Escape Room. On Wednesday you can watch the escape live on YouTube and you can even participate. Via live chat viewers can help the player to solve the puzzles in order to ensure his escape. Players can already search the room in advance, using the 360º game, allowing them to gather valuable clues. I am pleased to see so much renewal in the Zapp mission. Especially the decision to add YouTube to the journey, because this is one of the most important platforms for the young audience. Going live right away is such a great move. The first escape already has 386,000 views on the channel of Zapp live, and 700,000 views on the channel of the first player Enzo Knol, who is not a part of the mission. These numbers are very impressive for a Dutch project. If I have to name one point of improvement it is that there is a clear difference in production value between the various components. The daily series looks very good, the acting, the sets and the special effects are a lot better than in the Zapp mission. And although the puzzles are well conceived and the kids are triggered to play, the art direction of the Escape Rooms is inadequate. Every week we see the same office space with different props. As I told you in an earlier post, I am a big Escape Room fan, and if I had paid for one of these rooms, I certainly would’t give it a good review. I realize that there’s only two days time to redecorate the room before the 360º game is launched, but it is still a pity. Perhaps it is because of the division of the budget and the fact that online projects continue to be subordinated, right Tim Hofman? Nevertheless, I would like to end positively, because Lost in the Game is yet another innovative feat by KRO-NCRV. I’m already looking forward to next year’s Zapp mission.